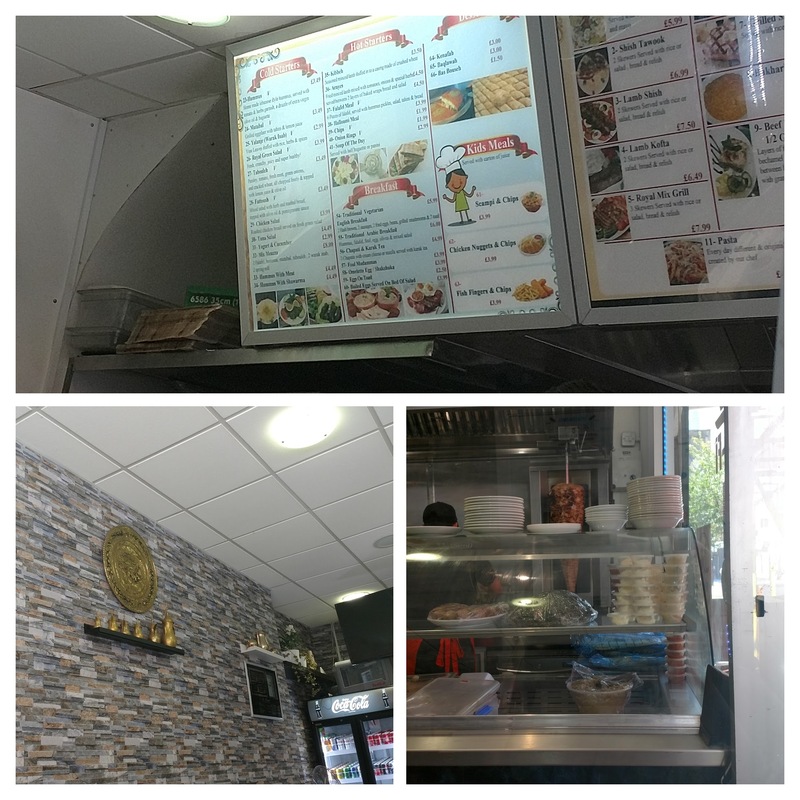 City centre shawarma – the Royal Coast Café, Cardiff City centre. 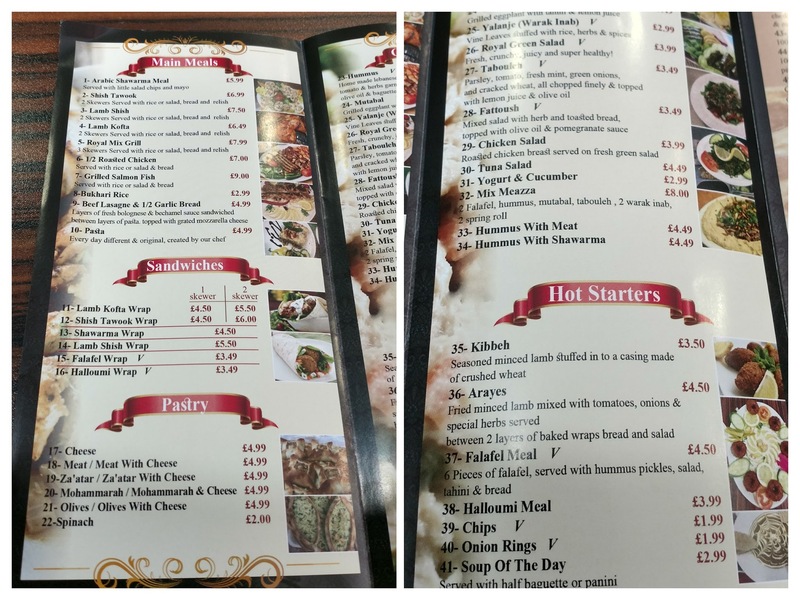 When it comes to Middle Eastern food the go to places in Cardiff tend to be in the East of the City – predominantly the Roath area, with City Road having more than its fair share of quality places serving food from the Levant and further east. In my neck of the wood the pickings are rather slimmer, although we do have the excellent Sen BBQ on Cowbridge Road East. Neither City Road nor Cowbridge Road East are, however, options for a work day lunch (with me being based in the City centre). On this basis, I was intrigued by a sign I saw on Queen Street (pointing down towards Charles Street) indicating Middle Eastern food including Shawarma (akin to the Turkish doner or a Greek gyros). When done properly a shawarma is a lovely thing. Flavoursome, well seasoned, succulent, meat in hot flat bread and a generous loading of salad and sauces makes for a very satisfying meal. Done badly it is a thing of next day nightmares, when you wake up bitterly regretting your drunken stupidity for eating one when 9 sheets to the wind (in my youth a common occurrence, now I am older and wiser – well older – less so). 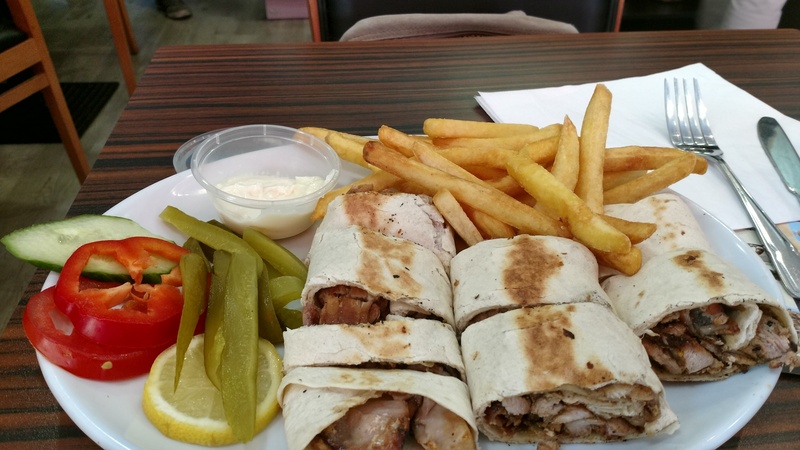 I hoped (particularly as it is not a late night place – opens till 9pm) that the Royal Coast Café would deliver the former sort of shawarma, which to me makes for ideal lunch time fodder. Not the most welcoming of sites, sitting on the rather dull strip down from Burger King on Queen Street before what I regard as the proper start of Charles Street. 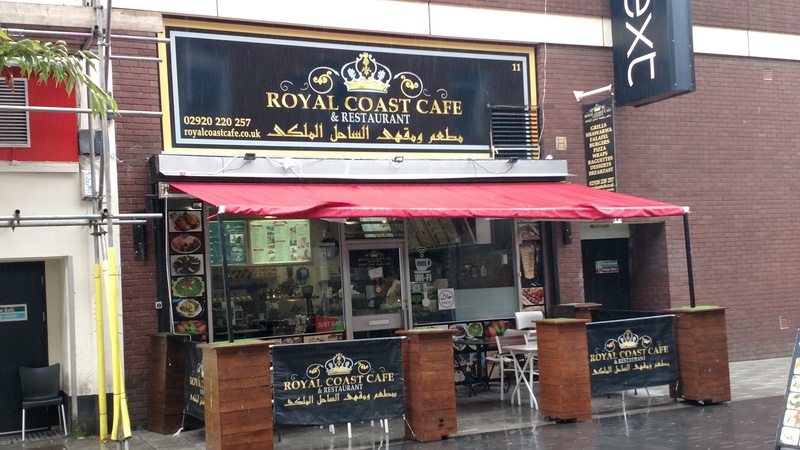 There have been a number of failed sandwich based enterprises on this site and Royal Coast’s Levantine based offering represents a step change from the previous incumbants. Inside it is fairly functional, with boards behind the counter advertising the places offering and prices, but nice enough. Food is prepped in an open kitchen to the side of the entrance – very tight space, but they dealt with the limited space very well. 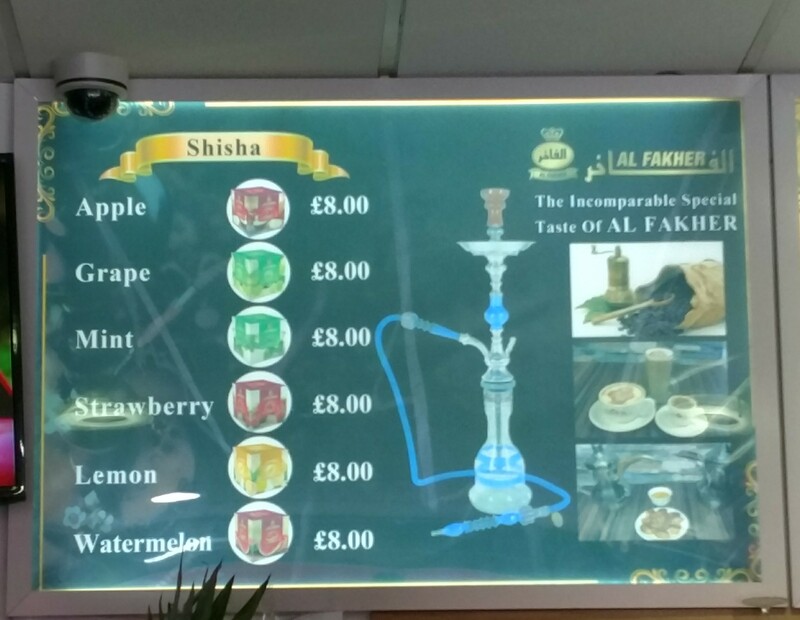 There have made up a pleasant outside sitting area where you can (should you so wish – I don’t as gave up smoking 25 years ago and not have one puff since) partake of a Hookah/Shisha. Plenty of takers whenever I have walked past it though. In summary, it is functional – but more than acceptable for lunch (probably not a date night venue with Mrs. SF, if I wanted to live past my current age, though). 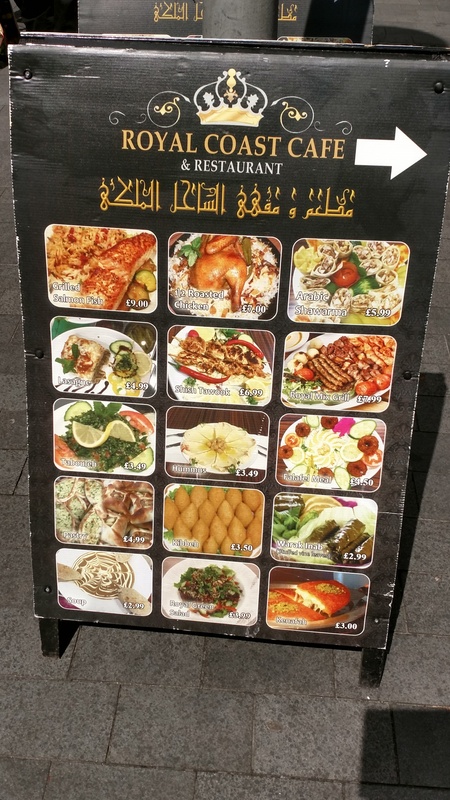 All the classics from Levantine cuisine are here and if I wasn’t intent on a shawarma I would have been spoilt for choice. The kibbeh, arayes and fattouch from the starters and the lamb shish from the mains particularly appealed. I was, however, in the mood for shawarma and the contents of the rotating spit didn’t put me off in the slightest (quite the contrary, unlike the ones at many a late night kebab gaff). 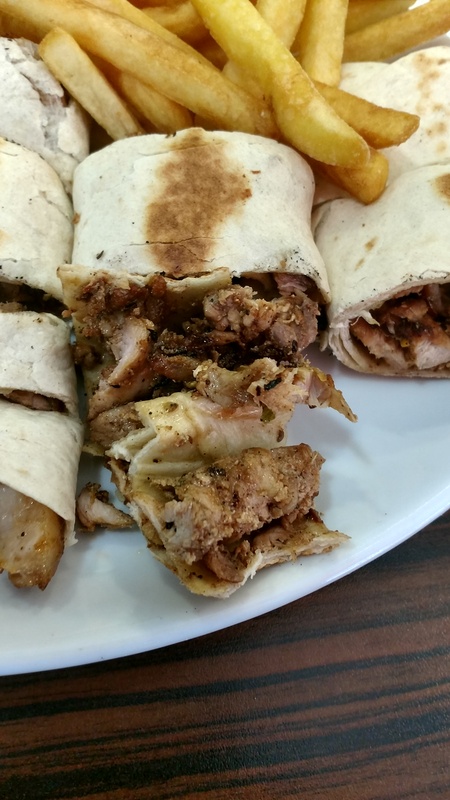 My Arabic shawarma meal (£5.99) was a generous portion of nicely cooked and succulent chicken (risk with a shawarma is it becomes dried out – not the case here I am pleased to report). It was nicely spiced with a good range of Middle Eastern favours. Spiced rather than hot, chilli fiends may consider it a touch tame, but hot sauce was on the table to spice things up if needed (I am a chilli wuzz, so passed). The chicken was wrapped is a nice parcel of warm, slightly crisped up, flat bread. I liked the fact it was cut up into bite sized chunks (made for perfect vehicle for transporting said chicken into gob with minimal effort). It came with a decent portion of somewhat average chips, some very nice pickled cucumber, a couple of slices of fresh cucumber and red bell pepper as well as a pot of garlic mayo. Good portion size for lunch and the £5.99 price tag, but I would have preferred more (quantity and interesting) salad items and sauces in lieu of the chips if I am honest. Some very nice sounding and keenly priced wraps are available for eat in and take out, so good also as a place to pop into for food on the go. Their breakfast offering also appeals (bar from the sop to a full English with veggie sausage and no bacon – the place is, as you would expect, resolutely halal) with shakshuka and what looks like an interesting traditional Arabic breakfast number including the unfortunately named foul (despite the name I have enjoy this, broad bean number, on divings trip to the Red Sea). 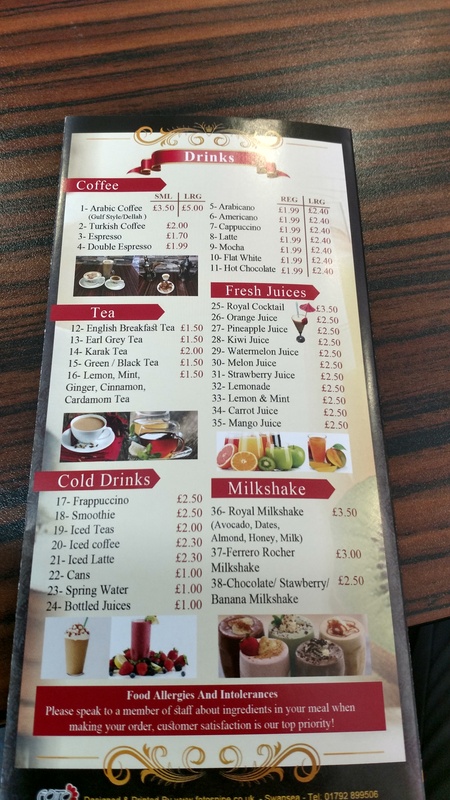 They offer a nice selection of hot and soft drinks, with a wide and interesting offering of juices and shakes. it was a hot day and I fancied a refreshing juice. 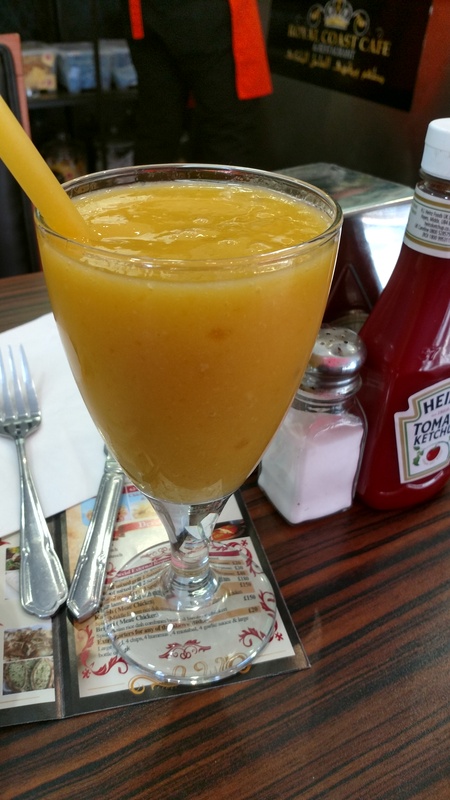 I am a sucker for mango in all its guises and love it’s fragrancy in a juice. So mango juice (£2 50) it was. Almost a slushy, it was made to order (I heard the machine going with the ice being pulverised), with a nice flavour to it and was very refreshing. Just the job with my shawarma. Next time I think I will try their Arabic coffee. I enjoyed my shawarma at this place, which was tasty, filling and good value. The fact that on my visit and every time I have walked past it has been busy with customers of a predominantly Arabic descent also suggests to me that it passes the authenticity test. Would I go back? Yes – good value and tasty on the food front always floats my boat. Address: 11 Charles Street, Cardiff, CF10 2GA. 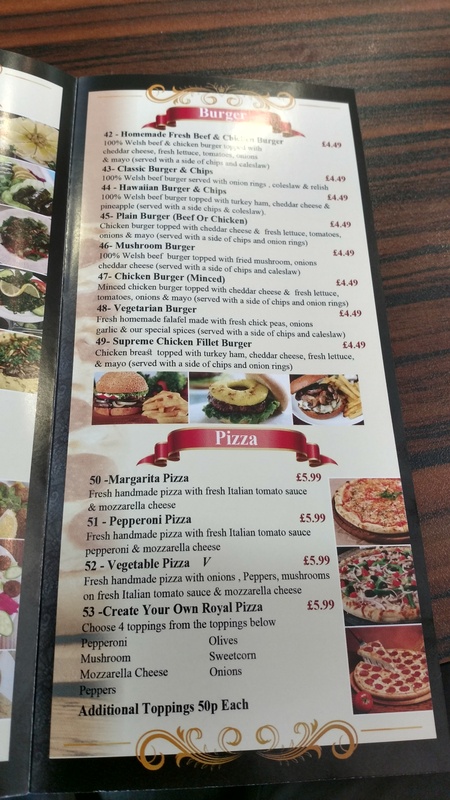 This entry was posted on Jul 30, 2017 by solicitingflavours in Arabic food, breakfast, burgers, cafe, Cardiff, Cardiff restaurant, coffee, Fast food, Food, kebab, lamb, Levantine food, Lunch, lunchtime, Pizza, restaurant review, review, Royal Coast, Royal Coast Cafe, salad, Sandwich, Sen BBQ, shawarma, Take away, Takeaway, Tea, Uncategorized, Wales.